Elgin doesn't belong on the list. That's what you're thinking. Not the guy who wore goofy sweaters to the NBA lottery every year. Not the unofficial caretaker for the worst franchise in professional sports. You might accept him on the "Worst GM" list, or even the "Celebs Who Looked Most Like Nipsey Russell" list. But not the list above. Not with Jesse and Jackie and Russell and Brown and Oscar and Ali. That's a stretch. That's what you're thinking. 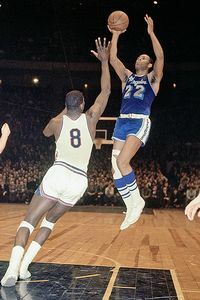 The godfather of hang time, Elgin Baylor changed a game that had been played below the rim. So come back with me to 1958, the year Elgin took Seattle University to the NCAA title game and then skipped his senior season to join the Minneapolis Lakers. If you don't think Minneapolis is teeming with black people now, you should have seen the city in 1958. America hadn't really started changing yet. Blacks were still referred to as "Negroes" and "coloreds." They drank from different water fountains, stood in their own lines for movies and were discriminated against in nearly every walk of life. When Elgin entered the NBA, the unwritten rule was every team could employ only two black players. Nobody challenged it. The St. Louis Hawks even captured the 1958 title with an entirely white team. Elgin came into a league where guys shot running jump hooks and one-handed set shots. Teams routinely took 115 shots a game and made less than 40 percent of them. Nobody played above the rim except Russell; nobody dunked, and everyone played the same way: Rebound, run the floor, get a quick shot. Quantity over quality. That's what worked. Or so they thought. Because Elgin changed everything. He did things that nobody had ever seen before. He defied gravity. Elgin would drive from the left side, take off with the basketball, elevate, hang in the air, hang in the air, then release the ball after everyone else was already back on the ground. You could call him the godfather of hang time. You could call him the godfather of the "WOW!" play. You could point to his entrance into the league as the precise moment when basketball changed for the better. Along with Russell, Elgin turned a horizontal game into a vertical one. It's impossible to fully capture Elgin's greatness five decades after the fact, but let's try. He averaged 25 points and 15 rebounds and carried the Lakers to the Finals as a rookie. He scored 71 points against Wilt's Warriors in his second season. He averaged 34.8 points and 19.8 rebounds in his third season -- as a 6-foot-5 forward, no less -- and topped himself the following year with the most amazing accomplishment in NBA history. During the 1961-62 season, Elgin played only 48 games -- all on weekends, all without practicing -- and somehow averaged 38 points, 19 rebounds and five assists a game. Why was this better than Wilt's 50 per game or Oscar's season-long triple-double? Because the guy didn't practice! He was moonlighting as an NBA player on weekends! Wilt's 50 makes sense considering the feeble competition and his gratuitous ball-hogging. Oscar's triple-double makes sense considering the style of play at the time -- tons of points, tons of missed shots, tons of available rebounds. But Elgin's 38-19-5 makes no sense whatsoever. I don't see how this happened. It's inconceivable. A U.S. Army Reservist at the time, Elgin lived in a barracks in the state of Washington, leaving only whenever they gave him a weekend pass ... and even with that pass, he could only fly coach on flights with multiple connections to meet the Lakers wherever they happened to be playing. Once he arrived, he would throw on a uniform and battle the best NBA players alive on back-to-back nights -- fortunately for the Lakers, most games were scheduled on the weekends back then -- and make the same complicated trip back to Washington on Sunday night or Monday morning. That was his life for five months. The only modern comparison would be Kobe's 2004 season, when the Lakers star was accused of sexual assault and flew back and forth between Colorado and Los Angeles or wherever the Lakers happened to be playing. You might remember everyone making an enormous deal about Kobe's "grueling" season even though he was flying charters and staying at first-class hotels. Well, can you imagine if Kobe had been re-enacting Elgin's '62 season? The world would have stopped. We would have given him the MVP on the spot. Forty-six years later, nobody even remembers Elgin's 38-19-5 happened. 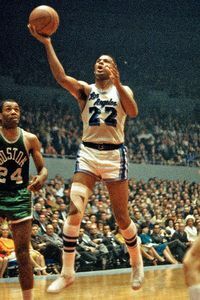 When he carried the Lakers to the cusp of a championship against a juggernaut Celtics team -- becoming the first-ever member of the 60-20 Club in the process (in Game 5, Elgin exploded for an incomprehensible 61 points and 22 rebounds) -- he came within an errant Frank Selvy 10-footer of winning the title in Boston. Standing under the basket, Elgin jumped too soon for the rebound and didn't tip it in. He would never come closer to a ring. He wrecked his knee during the '64 season and was never the same, although it didn't stop him from making first team All-NBA for 10 of 11 seasons from 1959 to 1969. He played in the Finals seven times, never winning a title despite a series of near-misses. During the first two weeks of the '72 season, Elgin believed he was holding back a potentially great team and retired nine games into the season. The Lakers immediately rolled off a record 33-game winning streak and eventually beat the Knicks for the title. How many guys have the dignity to walk away when it's time? How many would have walked away from a guaranteed ring? When does that ever happen? Elgin lived through some things during his career that we like to forget happened now. Lord knows how many racial slurs bounced off him, how many N-bombs were lobbed from the stands, how much prejudice he endured on a day-to-day basis as the league's signature black star. Russell bottled everything up and used it as fuel for the next game: He wouldn't suffer; his opponents would suffer. Oscar morphed into the angriest dude in the league, someone who screamed at his own teammates as much as the referees, a great player who played with an even greater chip on his shoulder. Elgin didn't have the same mean streak. He loved to joke with teammates. He never stopped talking. He loved life and loved playing basketball. He couldn't hide it. And so his body soaked up every ugly slight like a sponge. Hundley: "The people who put on the game wanted me to talk to Elgin about playing. After pregame warmups, I went into the dressing room and he was sitting there in his street clothes. I said, 'What they did to you isn't right. I understand that. But we're friends and this is my hometown. Play this one for me.' Elgin said, 'Rod, you're right, you are my friend. But, Rod, I'm a human being, too. All I want to do is be treated like a human being.' It was then that I could begin to feel his pain." Baylor: "A few days later, I got a call from the mayor of Charleston and he apologized. Two years later, I was invited to an All-Star Game there, and out of courtesy I went. We stayed at the same hotel that refused us service. We were able to eat anywhere we wanted. They were beginning to integrate the schools. Some black leaders told me that they were able to use what had happened to me and the other black players to bring pressure on the city to make changes, and that made me feel very good. But the indignity of a hotel clerk acting as if you aren't there, or people who won't sell you a sandwich because you're black ... those are the things you never forget." And he didn't. If you read about the great black athletes from the '40s, '50s and '60s, everything comes back to the same point: The respect they earned from peers and fans was totally disproportionate to the way they were treated in their everyday lives. When Russell bought a house in a white Massachusetts suburb, his neighbors broke in, trashed the house and defecated on his bed. When Elgin was serving our country in 1962 and potentially sacrificing his livelihood, there were dozens of towns and cities strewn across America that wouldn't serve him a meal. Black stars felt like two people at once, revered in one circle and discriminated against in another. Just because America changed over the last four decades doesn't mean those guys forgot the way it used to be. Throw in today's nine-figure contracts and the babying and deifying of today's basketball stars and you can see why they would be a little bitter. Baylor never won an NBA title, but he did the Lakers to the NBA Finals seven times. Do any of the modern players realize that someone like Elgin paved the way for their eight-car garages and McMansions? Frustrated by low wages, excessive traveling and the lack of a pension plan, Elgin, Oscar, Russell and others decided to strike at the 1964 NBA All-Star Game in Boston. It was one of the ballsiest and shrewdest decisions in the history of professional sports that nobody ever mentions; every financial development with the NBA (the players' union, escalating salaries, you name it) basically started on this night. The players told commissioner Walter Kennedy two hours before the game that they weren't playing without a pension agreement in place. With ABC televising the game and threatening Kennedy that any potential TV contract would go up in smoke if the players left them hanging with dead air, Kennedy agreed 15 minutes before tipoff to facilitate a pension deal with the owners. This was the first instance in American history of professional athletes risking their careers and paychecks for a greater good. And ultimately, you had what turned out to be the first pension plan of the modern sports era, the first real victory for a players' union in sports history. According to David Halberstam's "Breaks of the Game," the votes were split in the locker room. A few influential stars wanted to play and negotiate later, including Wilt, the league's biggest draw at the time Just when it seemed like the dissenting players might convince everyone else to play, Lakers owner Bob Short sent a message down to the locker room ordering Jerry West and Baylor to get dressed and get their butts out on the court, sending the entire locker room into "Eff these guys, we're not playing!" mode. And they didn't. The seeds for free agency and big-money contracts were planted on this night. Elgin never forgot the night his owner tried to order him around like a caddie. For whatever reason, this story never developed legs historically, although we hear about Curt Flood and Marvin Miller all the time. That just goes with the territory with Elgin. Only die-hard fans remember at this point that, by any calculation, Elgin was one of the eight or nine greatest players ever and the second best forward behind Larry Bird. From a historical standpoint, it definitely works against him that he never won a title or that there just isn't enough "I can't believe how good he was" videotape of him. (Note: I have seen some of the early Elgin tapes and can't emphasize this strongly enough -- watching Elgin dismantle his "peers" is like watching the scene in "Back to the Future" when Marty McFly starts cranking his electric guitar solo as everyone else stares at him in disbelief. Imagine someone showing up for an NBA game this season who could dunk from the 3-point line. Routinely. That's what Elgin looked like compared to everyone else.) He didn't have that signature "thing" to carry him through eternity, nothing with the legs of Oscar's triple-double, Russell's 11 rings, Wilt's various records, the Magic-Bird rivalry, Jordan's six titles or even West's becoming the league's logo. You rarely hear Elgin mentioned with the big boys anymore. Unless you're talking to an NBA fan over the age of 50. Then they defend Elgin and berate you for not realizing how unbelievable he was. You know Elgin Baylor as the longtime general manager of the Clippers. Blessed with a kind face and a happy smile, almost like the grandfather in a UPN sitcom, he's the Hall of Famer who sits with the other embarrassed GMs during the lottery every spring. I have made many jokes about Elgin over the years. He's an easy target. This is a man once described by TNT's Reggie Theus as "a veteran of the lottery process" ... and he meant it as a compliment. During last June's draft, I slammed Elgin for trading down two spots -- from No. 2 to No. 4 -- and passing up a sure thing (Emeka Okafor) for a high school point guard (Livingston), adding that, "Having Elgin Baylor run your team must be like getting in the car with my mom at night, when she's careening off curbs and saying things like, 'I can't believe how bad my eyes have gotten' and 'We shouldn't have ordered that bottle of wine.' Just constant fear." Well, Elgin wasn't too happy about that one. Much to my surprise, he reads more Clipper-related articles and columns than one would think. When he found out I was coming for lunch, he wasn't pleased. Coincidentally, he ended up in the Staples cafeteria at the same time we were eating; one of my lunch partners asked Elgin at the salad bar if he wanted to join us. Elgin glanced over at our table, noticed me sitting there and growled, "That guy's an [expletive]." Only he used a seven-letter expletive, placing most of his emphasis on the first three letters. For instance, let's pretend the word was "Bassbowl." Elgin would have said it, "That guy's a BASS-bowl." People loved that story. Of everything I ever wrote for ESPN.com, it's easily one of the most popular anecdotes I ever passed along. You bassbowl! I hear that 10 times a year at Clipper games. And you'd think Elgin and I didn't get along, but actually, the opposite was true. It took me two years to win him over, but by last season, we were getting along really well. When I filmed last December's "E:60" piece about shooting a half-court shot at a Clippers game, their organization had been splintered into three camps -- Elgin's camp, coach Mike Dunleavy's camp, and the camp run by owner Donald Sterling and team president Andy Roeser -- with the three sides uneasily coexisting like oil, water, and whatever would uneasily coexist with oil and water. I knew there was a festering problem when Dunleavy and I had a good-natured shooting contest for $100 and I ended up winning. We were on camera, and I forgot to collect. Dunleavy disappeared. Elgin quickly limped over looking like he had just seen an old lady get mugged. "He never paid you, did he?" Elgin whispered. Baylor's mediocre career as a GM overshadows his accomplishments as one of the league's best players. When Elgin gets mad, he stammers a little. So the next few words came out like this: "And you-you-you know what else? He went first, but after you made your shot, he-he-he made it seem like he had last shot. Did you catch that?" "I caught it," I said. "I thought it was funny that he cheated." "I'm glad you caught that," he said. "I didn't think you caught it." We ended up talking about basketball for the next 25 minutes while the camera guys packed up their stuff. Every time I ever question my choice in life for a profession, I always come back to moments like this: Talking hoops with someone like Elg, someone who will live on long after we're both gone. The Dunleavy thing just killed him. You could see it. When the Clippers turned things around in 2006, it happened because Elgin had picked Chris Kaman and traded for Elton Brand and Sam Cassell ... and Dunleavy's contribution was basically, "let's pass on Danny Granger for Yaroslav Korolev." Even though Elgin was the most beloved figure in the Clippers office -- and that's an understatement -- Dunleavy knew how to play the game and Elgin was too freaking old to bother anymore. Times were changing with the Clippers. Elg could see the writing on the wall. I could see it in his face that day, and I could see it for the rest of the season. Worried that the 2008-09 campaign would be his last, I called a mutual friend to schedule lunch with Elgin in August. I wanted to write a column about him. At 74 years old, he was the oldest high-ranking NBA employee by far, the last link to the days of Russell and Cousy, when black players had to eat at a Greyhound station because somebody wouldn't serve them, when you blew out your knee and you were never the same, when you played 27 exhibition games in 20 days because your owner made you do it. One time I asked Elg how he felt about chartered planes and he flew off the handle. "Sheeeeeeeeeet," he said. "When I played, we flew coach and carried our own bags! We landed two, three, four times! You ever hear about the time we crashed in a cornfield?" You probably don't know that story either: The 1960 Lakers once landed in a snowy cornfield with fire engines and ambulances chasing them. The plane had lost power and everyone thought they were going to die. To this day, it's the closest an American professional sports team has ever come to perishing in a plane crash. 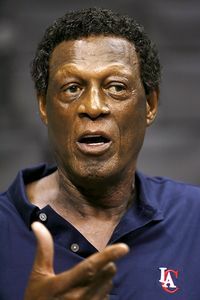 For Elgin Baylor, it was just another thing that happened to him. That's why I thought it would make for a great column -- just lunch with Elgin, him ranting and raving about stuff like that. To make sure Elg would make it, I mentioned to our mutual friend, "Make sure you tell him that he should have tipped in the Selvy shot, I saw the tape." "Elg is going nuts. He says you don't know what you're talking about. He says Sam Jones pushed him, that's why he didn't tip it in. He says Sam even admitted it to him afterward." "I don't know," I said. "That's not what the tape shows." "Well, you picked the right button to push. He'll be there for lunch. Just be ready to hear about this for an hour." We scheduled a date and planned to see each other then. A week later, they postponed. Something came up. We planned on rescheduling, then fate intervened: The power struggle escalated and the Clippers spent the next few weeks yanking Elgin around, finally canning him this week and naming Dunleavy their new general manager. (Insert sound of every Bucks fan laughing hysterically.) The team's employees were told Elgin resigned, only Tuesday's terse statement didn't mention anything about a resignation. The situation was handled just like the Clippers handled nearly every other situation in the past 25 years: Terribly. Of course, that terse statement mentioned nothing about Elgin's 50-year association with the NBA and all the hits he took along the way. We might elect our first black president in four weeks; this wouldn't have a chance of happening without the strength of people like Elgin once upon a time. If you're younger than 40, when you think of Elgin, you probably remember him wearing one of those Bill Cosby sweaters and wincing because the Clippers' lottery number came too soon. That's the wrong memory. You should think about him creating hang time from scratch in 1958. Think of him putting up a 38-19 in his spare time in 1962. Think of him dropping 71 on the Dipper. Think of his eyes narrowing as they passed along his owner's condescending message during that snowy day in Boston. Think of him retiring with dignity because he didn't want to hang on for a ring. Think of him telling Hundley that he couldn't play that exhibition game in West Virginia, not because he was trying to prove a point, but because it would have made him feel like less of a human being. Elgin ended up leaving the Clippers on the same day Barack Obama took part in his second presidential debate. The two events weren't related at all. Or so it seemed. On his final night in the NBA, his friends with the Clippers called him and e-mailed him to say goodbye. None of them heard back from him. Elgin Baylor was gone and didn't want to be found. Fifty years, gone in a flash. For the most underappreciated superstar in NBA history, it couldn't have ended any other way.